With a Black Lives Matter supporter who also may support the terrorist group ISIS now under arrest for attempting to attack Donald Trump on Saturday in Dayton, Ohio, one day after massive protests in Chicago shut down a Donald Trump appearance, we take a look below at a new Emergency Alert video from Alex Jones in which he tells us that we could soon be witnessing the unfolding of a race war in America as well as two extremely important new alerts from the website of Steve Quayle including one from Steve requesting immediate prayers for the safety of Donald Trump and his family. As many astute All News Pipeline readers have been talking on the most recent story from Susan Duclos, "Videos Of Chaos! Trump Responds To Chicago Rally Cancellation As Protesters, Including Terrorist Bill Ayers, Killed Free Speech", every day that we move onwards in 2016 is beginning to look more and more like the year of 1968, especially after what happened in Chicago on Friday night. For those who don't remember or weren't yet upon this Earth, 1968 was a year of massive violence, political turbulence, civil unrest in over 100 US cities and the assassinations of Martin Luther King, Jr. on April 4th and Robert F. Kennedy on June 5th. To say the year was tumultuous would be an understatement. 1968 was also a year that helped to shape the eventual blossoming of the 'police state' in America as Richard Nixon was the eventual winner of the election in November and the government corruption that was allowed to take hold then, with some of the same political figures involved then who are still in the establishment that Amreica is in the process of legally overthrowing today via our electoral process. Thanks to ANP readers Oliver Churchill, AngelsAmongUS and Mom1965 for bringing up the budding similarity of 2016 to 1968 and for clearly noticing a hand involved in the Chicago riots of Friday who was also involved in the 1968 riots, convicted terrorist and Barack Obama friend and confidant Bill Ayers. 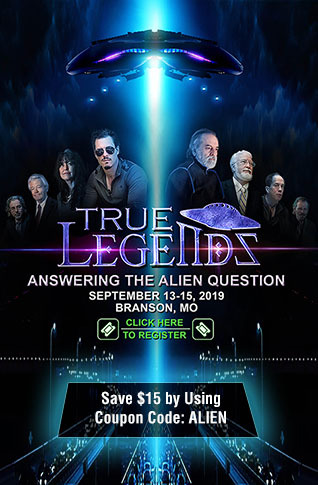 We'll also take a look below videos at two new SQAlerts that take a look at what is now happening in America from the viewpoint of prophecy and a warning given several years ago by Dumitri Duduman of coming civil war in America. 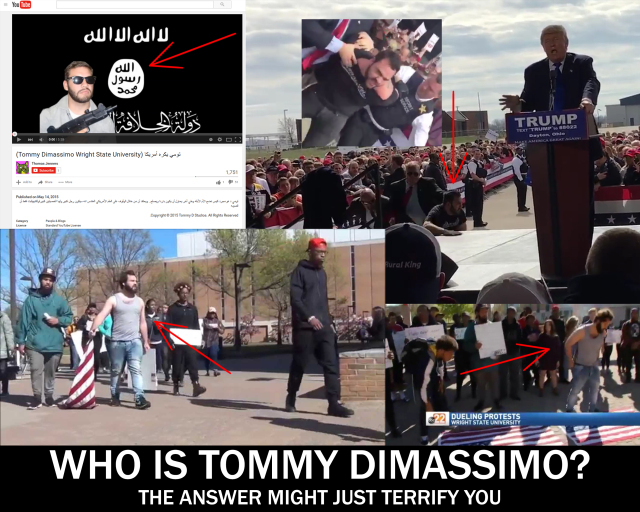 As the Conservative Treehouse tells us, the man arrested for attempting to attack Donald Trump has been named as Tommy DiMassimo. A photograph of Massimo, apparently from his YouTube channel, is seen below. Back on March 8th, ANP warned America that Black Lives Matter 'protesters' had put out a 'riot flyer' printed in both English and Arabic. 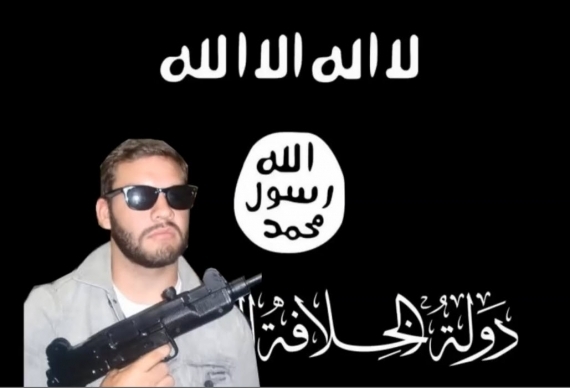 We asked if BLM supporters were planning on teaming up with ISIS to stop the 2016 election after both groups had made threats to stop the elections and as we see in the photograph below, the man who went after Trump today appears to be supportive of the terrorist group ISIS though Heavy.com has said the video is a hoax. 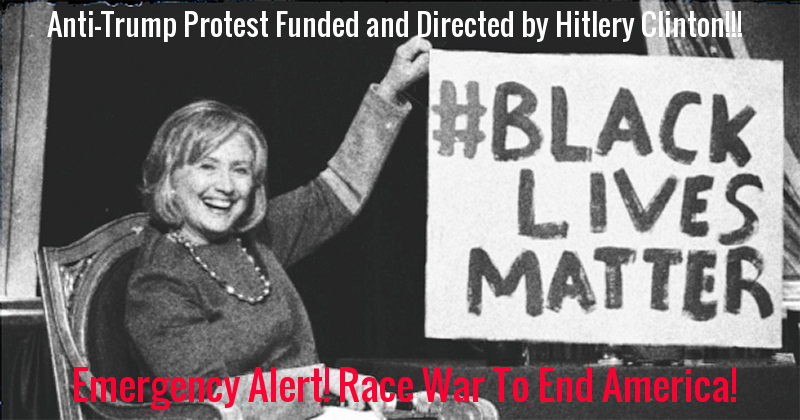 We also listen below to a newly released video report from Alex Jones called "Emergency Alert: Race War To End America" which he created after receiving a phone call from a former Bill and Hillary Clinton insider. In this linked story from Infowars, we also learn that Hillary Clinton is largely responsible for the recent protests against Trump as according to political insider Roger Stone, Hillary both funded and directed the latest attempts to bring down Trump. The 2nd video below is another must-see as Milwaukee, Wisconsin Sheriff David Clarke tells us that Americans supporting Donald Trump need to stand up if they see thugs breaking the law in Chicago or people like DiMassimo who are preparing to commit criminal actions such as he did. Sheriff Clarke also tells us that those who chose to protest violently are a threat to order, liberty and the United States of America and that the police in Chicago were vastly undernumbered to deal with such a huge protest. Telling us that these rallies were cancelled in the name of public safety, Clarke tells us that what we need to do is to cancel these rebellions in the name of public safety before something goes terribly wrong as the protesters have violated the 1st Amendment rights of not only Trump but everyone else there who wanted to peacefully participate in the rally. Clarke goes further in telling Americans that we better not back down from these goons and thugs and we need to begin standing up for ourselves. He also called for law-abiding citizens to step in if the police need a hand and are outnumbered as they were in Chicago Friday night. "Keep in mind, for the people who choose to peacefully attend these rallies, the numbers are on your side" Clarke tells us. Any martial artist would know that there is a huge difference between 'just violence' and 'unjust violence'. Clarke isn't calling for violence in this video but what he is calling for is the American people to stand up when thugs begin to take things to a violent level and do what is right. Clarke also takes on Hillary Clinton, Ted Cruz and Marco Rubio for recently attempting to stoke racial flames against Trump as America heads in a direction not seen in a very, very long time.